30 VDMA 2016 • VDMA MINING SUPPLEMENT Loesche recently purchased four of six mills it supplied to a power plant in 1984 for grinding coal. The power plant, which was operated by Electrabel Belgium, had been decommissioned in 2014. The mills, type LM 20.2D and LM 19.2D, were well maintained. Nevertheless, the company completely refurbished the mills and equipped them with a new classifier customized for future technical specifications. Loesche sells the refurbished mills with the new components for about half the price of a new model. The pre-owned mill can also be delivered more quickly than new mills. The availability and reliability of the refurbished mills, according to Loesche, are equal to newly manu- factured mills. 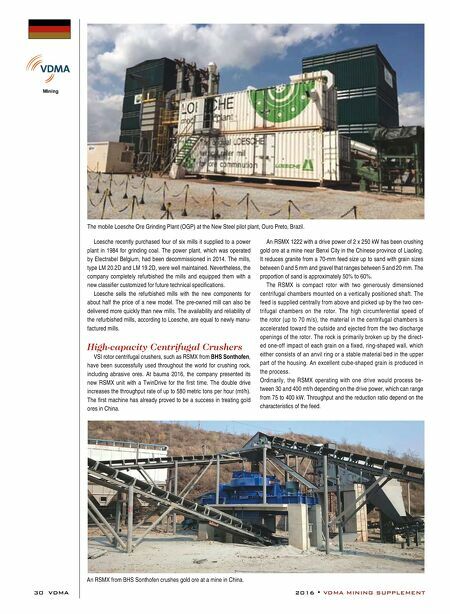 High-capacity Centrifugal Crushers VSI rotor centrifugal crushers, such as RSMX from BHS Sonthofen, have been successfully used throughout the world for crushing rock, including abrasive ores. At bauma 2016, the company presented its new RSMX unit with a TwinDrive for the first time. The double drive increases the throughput rate of up to 580 metric tons per hour (mt/h). The first machine has already proved to be a success in treating gold ores in China. An RSMX 1222 with a drive power of 2 x 250 kW has been crushing gold ore at a mine near Benxi City in the Chinese province of Liaoling. It reduces granite from a 70-mm feed size up to sand with grain sizes between 0 and 5 mm and gravel that ranges between 5 and 20 mm. The proportion of sand is approximately 50% to 60%. The RSMX is compact rotor with two generously dimensioned centrifugal chambers mounted on a vertically positioned shaft. The feed is supplied centrally from above and picked up by the two cen- trifugal chambers on the rotor. The high circumferential speed of the rotor (up to 70 m/s), the material in the centrifugal chambers is accelerated toward the outside and ejected from the two discharge openings of the rotor. The rock is primarily broken up by the direct- ed one-off impact of each grain on a fixed, ring-shaped wall, which either consists of an anvil ring or a stable material bed in the upper part of the housing. An excellent cube-shaped grain is produced in the process. Ordinarily, the RSMX operating with one drive would process be- tween 30 and 400 mt/h depending on the drive power, which can range from 75 to 400 kW. Throughput and the reduction ratio depend on the characteristics of the feed. The mobile Loesche Ore Grinding Plant (OGP) at the New Steel pilot plant, Ouro Preto, Brazil. An RSMX from BHS Sonthofen crushes gold ore at a mine in China.